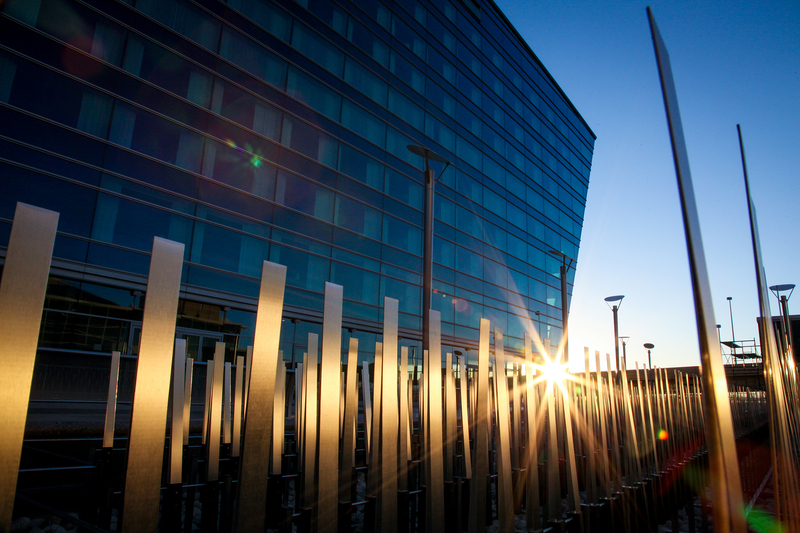 Outside In: Hotel & Transit Center Public Artwork is an exhibition located in the Airport Office Building (AOB) that features photographic work by DEN’s multimedia producer/photographer Ken Mostek. Located near the A-Bridge security checkpoint, a series of color photographs beautifully capture two significant and distinct public art pieces at the Westin and DEN’s Hotel and Transit Center. Artists Ned Kahn and Patrick Marold were artists selected through a competitive process to create distinctive exterior public art pieces. Completed in November 2015, Field of Air by Ned Kahn graces the open-air plaza while Shadow Array by Patrick Marold enhances the expansive landscape area around the public transit station. Field of Air by Ned Kahn is located at the open-air plaza between Jeppesen Terminal and Westin Denver International Airport. Kahn was inspired by the way the grasses of the plains expose the invisible force of the wind. Each of the thousands of individual blades are made from brushed aluminum and hinged so that the fascinating play of air on the plaza becomes a contemplative or even meditative backdrop to activity. Click here to view more photos of Mr. Kahn's installation. Shadow Array by Patrick Marold is located at the train platform exterior. Marold created the large-scale installation to enhance the expansive landscape area around the public transit station. The sculpture consists of 236 beetle-kill spruce logs from southern Colorado, which will create an active experience for travelers as they enter and exit the valley by train. The shadows and patterns created by the sculpture will change and shift according to the seasons, daily passage of the sun and with evening lighting. Click here to view more photos of Mr. Marold's installation.